"The world's favorite season is the spring. All things seem possible in May." 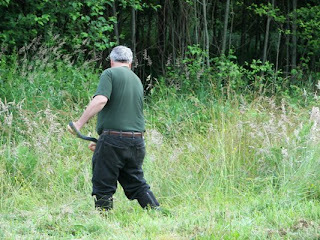 I think that May is without a doubt, the busiest month for chores. Spring seems to make its appearance overnight with grass growing faster than you can cut it. Sucker holes (patches of blue sky) tease you into starting an outdoor chore only to find yourself in the middle of a downpour a few minutes into the project. So you abandon the project and retreat indoors only to be lured out again a few minutes later. And so the cycle continues until you resign yourself to the fact that you are going to get wet or the project won't get done. That's when you know you have become a true citizen of the rainforest. In May I find myself "drunk" with possibilities for the garden. My head is filled with visions of luscious ripe tomatoes and dusky purple eggplant and fragrant sweet basil. Our short growing season has thwarted our first two attempts at tomatoes and eggplant but we've got a plan this year so be sure to check back often to see our plan is working out. The garlic we planted last fall is looking good and guests have already been enjoying the rhubarb, usually as a compote for panna cotta or Belgian waffles. My favorite greens, broccoli raab and escarole are sprouting. If you have never tried these, you're missing out on great Italian soul food. Either of these greens are great sauteed in garlic and olive oil as an accompaniment to a roast. 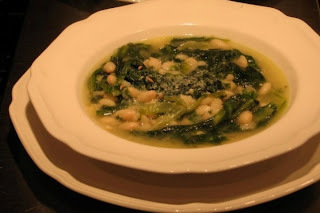 I especially like the escarole with a white bean soup sometimes known just as "beans & greens". The recipes for these great dishes are posted on our website. You can also learn how to prepare these dishes at one of our cooking classes. Gift certificates to a cooking class or a night at our inn with dinner make memorable gifts without adding more "stuff" to someone's life. In June we will be offering a class on Quick and Easy Pasta Dishes for Summer as well as our always popular Beginning Artisan Bread Baking. The details are on our website. Here are a few shots from our cooking classes. Bread production kicked into high gear this month with the opening of the Farm Market. In response to customers who have been requesting a whole grain bread, we are pleased to present our Oatmeal Bread made with a combination of white and whole wheat flour and of course, oatmeal. It's actually as delicious as it is healthy, and makes exceptionally great toast. And when you are throwing caution to the wind, you gotta have Kitty's Cinnamon Rolls. 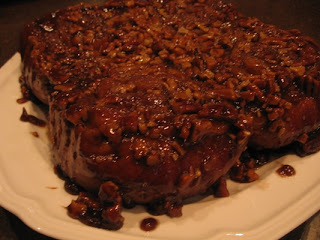 Or her Pecan Sticky Buns. There's more to say but the chores are calling . I'll be trying harder to keep this updated on a weekly basis. Until then, we hope you find spring full of possibilities.